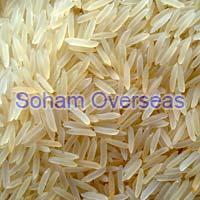 Golden Basmati Rice Manufacturer And Supplier In India - Get Best Price! Reckoned as one of the best golden basmati rice manufacturers and suppliers in India, Soham Overseas is highly sought-after for procuring the top-notch array at reasonable rates. Our offered golden basmati rice is apt for preparing a wide range of scrumptious delicacies, like biryani, puddings, and much more. Our quality controllers assure that the offered rice is free from insects, dust, and other miscellaneous particles. All credits to our processing team and agricultural experts who enable us to offer an authentic assortment which is rich in carbohydrates, fiber, potassium, and proteins. We offer this premium rice in a quality package of different sizes to meet the divergent requirements of the market.